in case there was any doubt about what an unbelievably caring boyfriend/soon-to-be-husband i have, rest assured, the doubt is gone. i had just gotten back from my dinner with ang and bdab, and was getting ready to work out when i noticed a flashing light on my hotel room's phone. i listened to my message and was told i had a package waiting downstairs. i was like "wtf? i didn't order anything". so i go downstairs and it's a delivery from ftd.com. 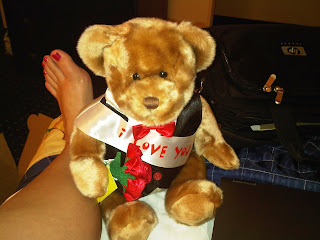 so, i go to ang's room to open it and it's a build-a-bear! i've never had one and i kinda love him! :) do you want to see pics? of course you do. please note the awesome new pedicured toes and tanning bed legs. 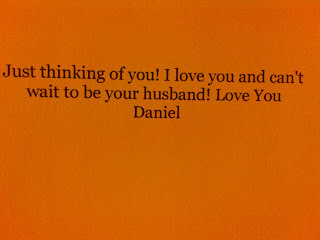 it makes me really happy that daniel does stuff like this. the distance is hard on us, especially with the wedding so close. i CANNOT wait until we don't have to live in separate states. and to think this all came from internet dating....wow. so my cool new workout shoes are not so cool. my feet were still on fire. what gives? am i doing something wrong? what am i missing? i went to the runner's store here and they picked out the shoes for my feet, so i really am floored now. the balls of my feet burn when i work out and my toes go numb. i just don't understand. i thought maybe i wasn't wearing the right size or something, but the nice sales lady checked them for me. (i seriously felt like a 5 year old.) i'm so going back to the store. $95? no thanks - shoes didn't work. any advice? anyone? still going strong on weight watchers this week. am anxiously awaiting the dmb shows this weekend. fun times to be had in the 'burgh. I dunno about the shoes, mine always feel like that too. I chalk it up to having feet retardation. internet dating huh? so it CAN work out. interesting. i chalk it up to fat retardation. blah. i need to figure out this problem. yes, yes, internet dating can work. promises. i drove 11 hours to meet him the 1st time. crazy, huh? Have fun at DMB!!! Whoo hooo! i love the bear! is his name mr. bear? it should def be mr. something...he so looks like a mister!